An accessory that has been growing in popularity over the years are vinyl mask sets. Mostly they were used for canopy masks and have become very popular. Another use for these have been for camouflage masks. This is one of several sets that Top Notch offers for the Bf-109G. This set is in 1/48 scale, but they are also available in the other major scales. 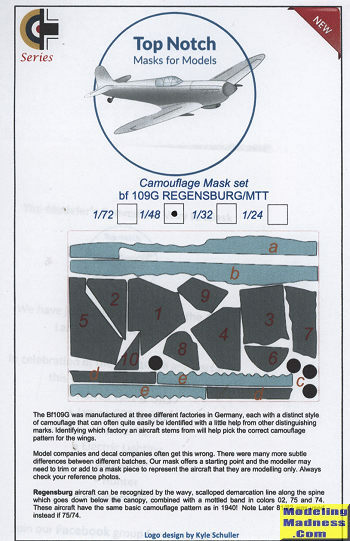 Some of you may not be aware that the 109 was manufactured by several companies and by this time in the war, they each had their own somewhat unique camouflage signature. 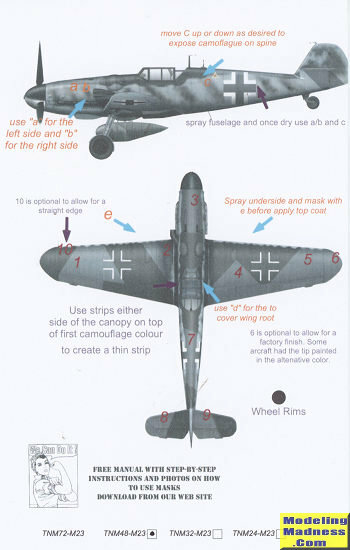 This sheet covers the planes build by the main Messerschmitt factory at Regensburg. They are recognized by a semi-high side color and the wavy demarcation line between the upper and lower colors. Now of course, these were not cookie-cutter patterns, but were all very similar as the people who painted these planes had often been doing it for a long time so had a certain style to it. In addition, the side mottling was often 'adjusted' at unit level. A nice addition to this one are masks for the wing roots and for the wavy lines on the leading edges of the wings. You also get wheel masks with this set. As with the other set reviewed, you paint the lighter color, apply the masks and then do the darker. There are helpful notes included. I know you will find this set very useful. Thanks to Top Notch for the review set. These can be found at this link.